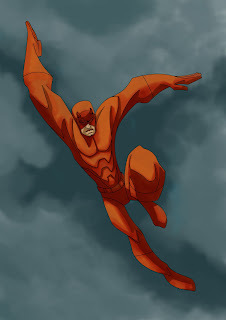 I got extra excited with our previous themes, so I starts with the Daredevil first. I did a quick line drawing and ink it in an hour or so before I rushed to the coloring. Almost done, then I realized that I forgot something... yup, the DD logo/emblem on his chest. Unforgivable, I know. forgiven, coz this totally kick arse! It's not too late to add the double-D's dude. ...hmm ok, that doesn't sound quite right -- LOL! A great piece bro. Great color choices! you will be the lead character designer for the new Daredevil animated series.